Two of my chickens decided to go broody on me. One has gone broody three times on me since I got her. I tried putting a golf ball in the other nest box to try to move her over but she went right back to the original nest and then another of them decided she was going to sit on the golf ball. 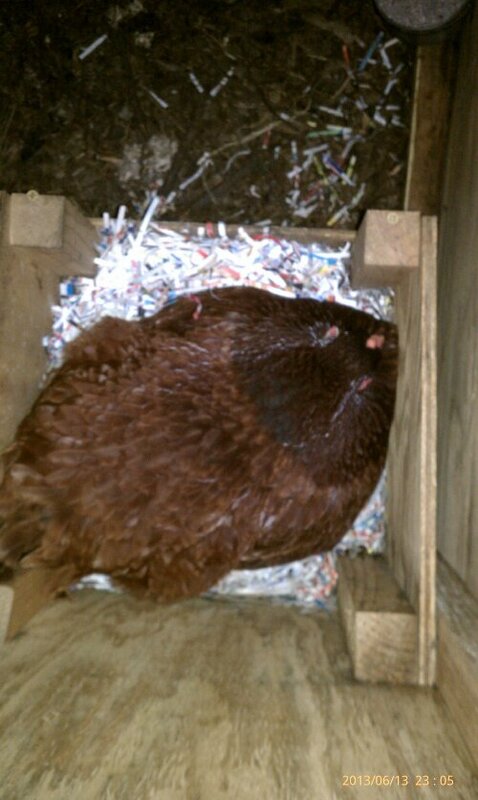 Well, since the one has gone broody so many times now I decided she could be productive and hatch out some eggs for me. I decided to check Craigslist to see if anyone out there was selling fertilized eggs. I really had no plan in mind on what kind of eggs I wanted but I was hoping for one of the heirloom breeds. 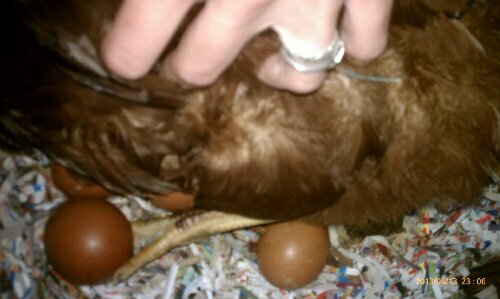 I ended up with birchen marans. The eggs are really dark brown and quite a bit bigger then the eggs my hens lay. I’d say my hens lay a large egg and these were an extra large if you go by the ones from the grocery store. I should have taken a comparison picture, but didn’t think of it. I bought 16 eggs, 8 for each hen. The guy gave me 18, two extra to account for non fertility of a couple. 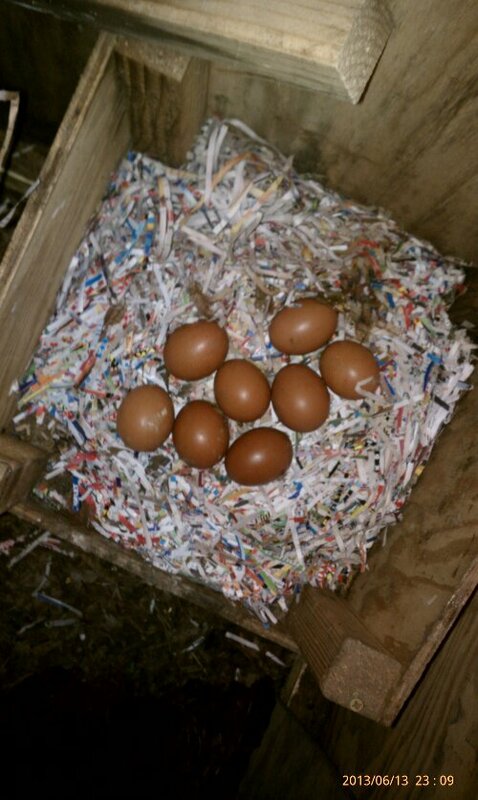 I picked up the eggs on June 2 and put them under the hens that night. We should be looking at having them hatch around June 22nd or so. Last night we candeled the eggs. Out of 18 we found 2 that were definitely bad, and one we weren’t sure about so we just went ahead and left it just in case. 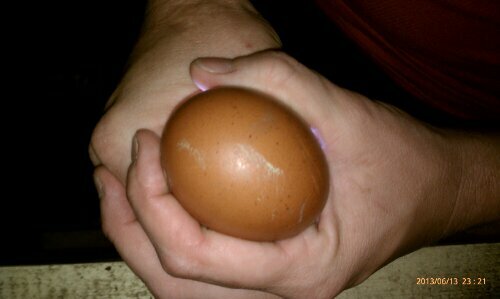 I imagine it will end up not hatching but since this was our first time we figured better safe then sorry. I tried to take pictures of the candeling but my camera phone was just not up to the task. We opened the two bad eggs when we got inside just out of curiosity. One was completely unfertile with no blood spot or anything. The other was a dime sized chick that had obviously not made it past the first several days. I would imagine if we were to open the other one that we suspect is bad we would find a quarter sized chick that had died a couple days past the other one. I am looking forward to the hatching. 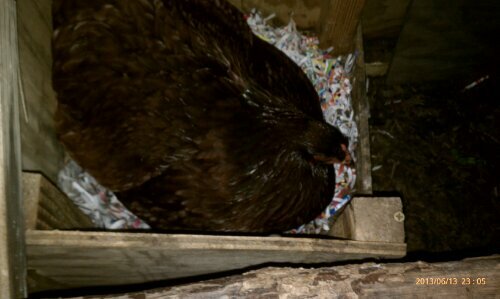 I am very excited to watch the hens raise their broods. 10 more days and they should be all hatched out!